The 2018 Mazda3 is the most popular sedan from the manufacturer here in Quebec, in Montreal, in Laval and in the West Island, and in addition, it has been named “Best Small Car in Canada for 2018” by the AJAC (Automobile Journalists Association of Canada). That it receives so many praises from professionals has nothing to do with chance, on the contrary, come test drive one and you will very quickly get why. The Mazda3 is a little bundle of energy and fun, thanks among others to its particularly strong structural design, its highly efficient manual transmission as well as its G-Vectoring Control technology that helps to reduce engine torque when you start to turn and notably allows for reduced body sway in curves. This technology improves driving dynamics for very precise steering. So, our small sedan is measured here against the 2018 Hyundai Elantra. The latter is sold at about the same price than the Mazda3, that is around $16,000. 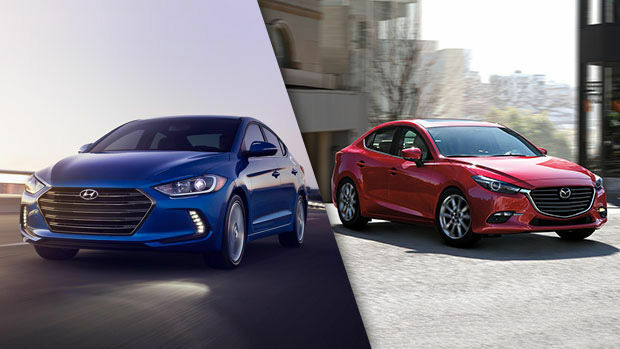 Engines of 2.0 litres and 4 cylinders are found on both vehicles, with a thrust of 147 horsepower for the 2018 Elantra, and of 155 horsepower for the Mazda3. Despite its greater cavalry, the Mazda3 has a better fuel-efficiency, with average ratings of 8.5/6.2 L/100 km as opposed to 9.3/6.4 L/100 km (city/highway) for the Elantra. Another point for Mazda! Aside from its prizes and awards of all sorts, the Mazda3 offers the Mazda unlimited mileage warranty, the i-ACTIVSENSE series of safety features and the SKYACTIV technology, well, all the elements that make it an absolutely outstanding sedan in all aspects. You will realize how much the 2018 Mazda3 is the one that you will want to park in your driveway, especially after you test drive both participants of this comparison on the roads. Reserve today your test drive at your Spinelli Mazda dealership in Lachine. Find out more about the numerous advantages offered by Mazda financing as well as the amazing offers proposed by Mazda promotions. We await you!